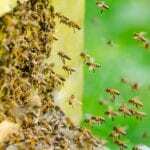 One of the questions we get often here at Florida Bee Removal is whether it is absolutely necessary to call us for beehive removal or if it is okay to just leave it alone. The majority of people are uncomfortable with having a beehive on their property and ask us to remove it and the bees, but there may be situations when it is fine to stick around. You raise bees. If you already have beehives and notice some wild hives on your property, you’ll want to have them removed so they don’t cause problems with the ones you are taking care of. Causing damage. Some types of bees can damage your structure, such as the carpenter bee, which bores holes into woodwork. In other cases, a hive may have started forming inside your home’s walls. We have the expertise to handle the architectural challenges here in Lakeland, Florida. Allergies. If someone in your home or a frequent guest is highly allergic to bees, you should call for beehive removal promptly. We offer emergency 24/7 response to remedy the problem quickly. Business property. You never want to leave a beehive on a commercial property because you don’t want to put customers and other visitors at risk. Inconvenient location. If the beehive is simply in the way, such as close to a door or window, for safety sake, call for beehive removal. Family wears fragrances. If a bee thinks it smells flowers, it could confuse it into stinging, so any fragrance product such as deodorant, perfume, aftershave or cologne could be a problem.